Last year was quite extraordinary in so many ways. The winter that dragged on so long we gardeners never thought we would see a green shoot; the spring that was so short and dramatic that everything blossomed and bloomed at once, bleeding into and mixing with the early summer show and then that long sunny summer which was such a sultry treat. It’s January now, and it hardly feels like we are even starting to embrace the winter – even though we are seeing such extreme wet weather conditions here in the UK and of course the arctic blast across the USA. There’s been a few hard frosts and lots of inclement weather but I still have a couple of roses blooming, the Rudbekias have only recently finished, their chocolate buttons still standing proud, and the tough old evergreens are looking as perky and shiny as they do in summer. I am amazed as I walk around the garden at the amount of plants which are sitting happily in the winter gloom. The less resilient plants are gracefully disappearing leaving the garden looking surprisingly tidy. I’m putting it down to the slightly higher temperatures we have experienced here in Glasgow this year (so far). The dry summer has given my garden a chance at fending off the worst of the wet weather and has not yet become waterlogged as it usually is. Looking good are my Cistus x obtusifolius ‘Thrive’ and Cistus pulverentus ‘Sunset’. Not only do they provide lovely repeat flowering during the summer, their attractive soft evergreen foliage is great during the winter. Sitting beside theses are my lovely Melissa officinalis and Penstemmon whose foliage is still looking so fresh you could be forgiven for forgetting it is January. The spikes of Libertia grandiflora are standing smartly in their space and even the faded-to-buff blades of my Hakonechloa macra grasses are providing some really good winter interest. Strangely, my Shizostylis coccinea has desperately tried to flower for the last month – but I just don’t think it will come to anything sadly. The warmer, wet weather has had some benefits although I find myself missing a good old freeze! A cold spell can be beneficial. Many plants, bulbs and seeds require it to trigger growth and indeed a cold snap has a cleansing action in the garden. A good frost will also help break up compacted topsoil when water freezes and expands within the soil, causing it to move and crack. This is one of the reasons you can put a layer of compost and manure onto your planting beds during the winter without necessarily digging it in until you plant up in spring. Mother Nature will help do the work for you! A good layer of snow will keep the spring bulbs warm and protected although it’s tough on our feathered friends. This is the time when we need to make sure we keep the bird feeders full and leave protected areas for over-wintering wildlife. It’s also wise to shake snow off any branches that are bending under its weight to stop them breaking. 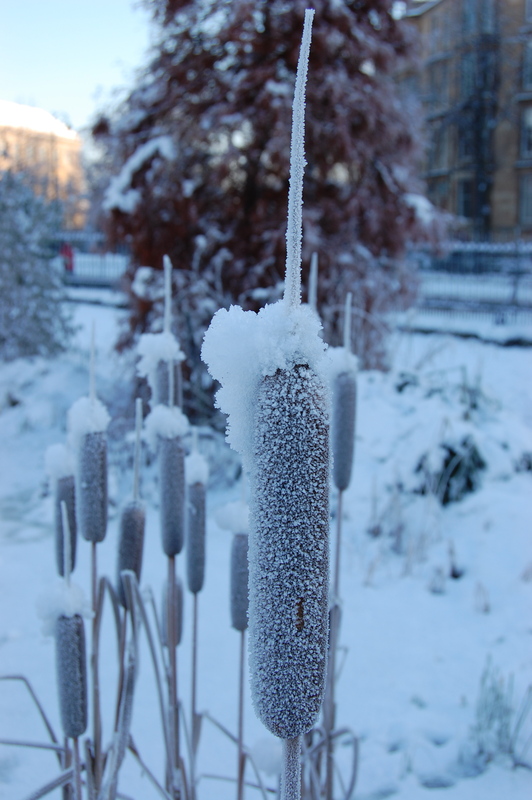 Lastly – another great benefit of a shivery freeze is the wonderful frosting that attaches itself to any structural planting still lasting in the garden. I think this is one of the most beautiful sights of winter when it happens. I say let’s embrace the cold when it comes but be aware of the challenges it presents to us gardeners and to the wildlife that is so important to the garden’s ecosystem.